This hush puppies recipe uses the broccoli stems instead of the head. Sounds weird right? Aren’t you suppose to throw the broccoli stem in the trash, or better yet the compost bin? No way! Broccoli stems are chock full of vitamins and nutrients. They have the same taste as broccoli heads, just a bit milder. 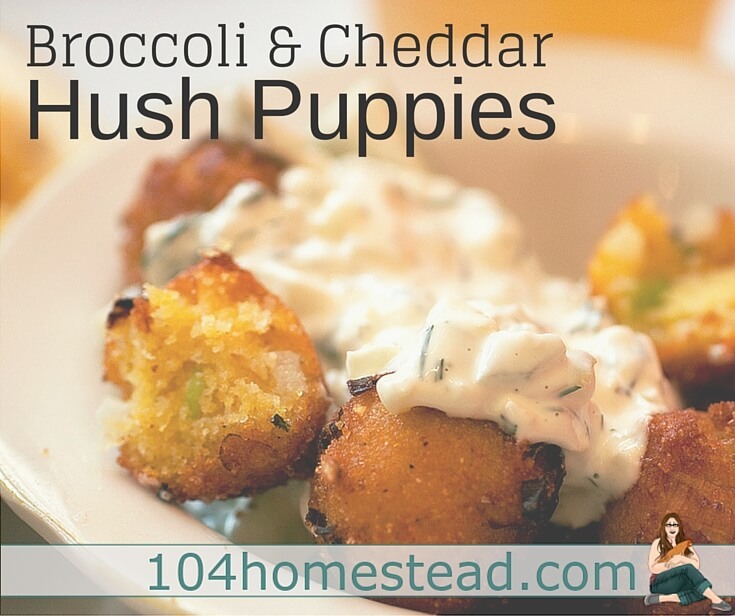 These cheddar hush puppies made with broccoli stems are sure to delight. In a large bowl, whisk together cornmeal, baking powder, salt, sugar, baking soda, cayenne pepper and black pepper until combined. In a separate, medium bowl, whisk together eggs and buttermilk until evenly combined. Stir in broccoli stems, cheddar cheese, onion and parsley. Stir the wet ingredients into the dry ingredients until evenly mixed. Heat 3″ of vegetable oil over medium heat in a high-sided frying pan or saucepan until the oil reaches 325°F. Batter should sizzle gently on contact. If it pops or burns quickly, the oil is too hot. Spoon rounded tablespoons of batter into the oil. Don’t crowd or they will stick. Fry until golden brown (2-3 minutes). Remove with a slotted spoon and let drain on a paper-towel lined plate. Get the printer-friendly version of this hush puppy recipe. It can be hard to tell when to harvest your broccoli. Here’s a guide to broccoli harvest. Sometimes I like to top my hush puppies with sour cream, but other times it’s ranch dressing for me. I use to buy the really pricey organic ranch dressing, but then I found out how easy it is. This recipe makes one serving. Finely chopped chives and/or parsley to taste. Whisk together buttermilk, mayonnaise, and vinegar. Season with garlic powder, salt, pepper, and fresh herbs to taste. Get the printer-friendly version of this ranch dip recipe. These sound delicious! I know my family would love these. Pinned. Use a potato/carrot peeler and peel the stems, even the large hard ones. The insides are VERY tender. You won’t believe it! Cook as usual. No more waste…..
It’s awesome to find creative ways to use those broccoli stems. I eat them with the broccoli just because I’m too cheap to throw them out and I don’t want to waste the vitamins either! Now I can make yummy hush puppies! !